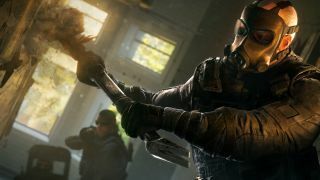 Ubisoft has released details on the Rainbow Six Siege season pass, a bundle of DLC and in-game perks to be doled out over the course of the game's self-proclaimed 'Year One.' As far as typical season passes go, this one feels a bit light at first glance, but it's heavy on progression boosts and access to new content sooner. So, the season pass just gives you a few things before everyone else, and helps you get them quicker while sporting a leopard print assault rifle. Cool. But at $30/£24 the price may feel a bit steep for anyone who doesn't become a diehard fan of the game. There's something to be said for Ubisoft's approach, value propositions aside. All new maps and operators are free for anyone who buys the game. The first dose of free is coming in a bundle called Operation Black Ice, sometime in Janurary. Included are "two new operators from the Canadian JTF2 counter-terrorism unit, a brand new map, and more." I liked Rainbow Six last time I played it, despite having a few minor criticisms. Let's hope Ubisoft's approach to Siege will be community focused—heck, it has to be. Retail-priced multiplayer only shooters live and die by their continued support, but at least it sounds like they're on the case. Rainbow Six Siege releases on December 1st this year.